Salmon thingy, beanie wienies, and celebration steak! *Sigh* What a week. Did I get it all done? Not yet. I did manage to cook three times. Sometimes I really have to stretch to think of what to cook. Maybe I’ll help you out with your meal planning. Cause it feels healthy and is pretty easy. Because I hardly ever cook fish and it’s supposed to be really good for you. 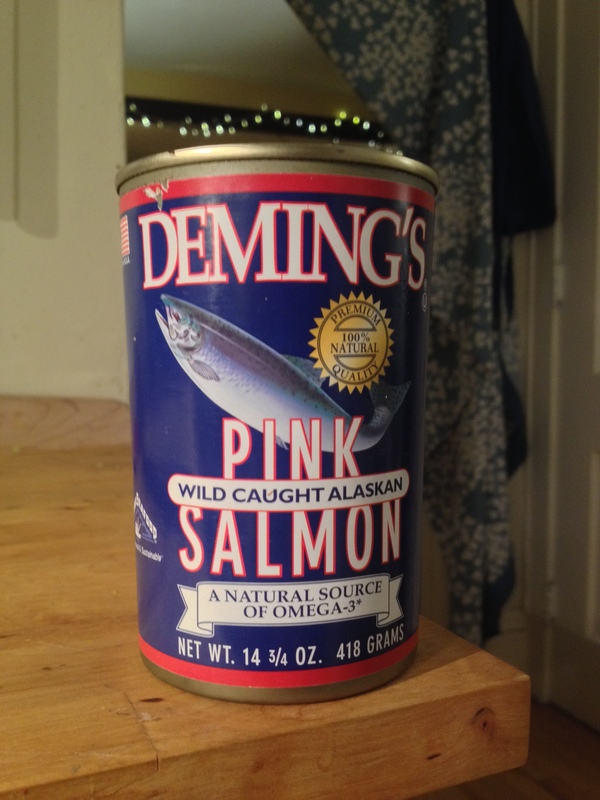 And I heard on MPR that canned fish is generally sustainable, healthy, and economical. Boiled pasta in well salted water. Desperately tried not to forget about it and overcook it. Tossed in chopped broccoli to the boiling pasta in the last minute of cooking. Drained and remembered to reserve some of the starchy water! OMG, that never happens! Fried up the usual onions and garlic nice and hot. Added the drained salmon. Let it fry up hot. This is where I would have added a bunch of white wine, but I didn’t have any. I added white wine vinegar, white miso paste, some paprika, and a little of the pasta water. Chopped up some old wilted vegetables, this time some bell pepper and cabbage. Added a jar of tiny capers and their juice. Yum. Mixed in the pasta and tinkered with the vinegar, salt and spices. Because it’s one of the few things that Will ever requests. I almost always think of it as camp food. On trail I make it with instant scalloped potatoes, freeze-dried refried beans, and a special seasoning mix of tomato powder, cumin, brown sugar and other good stuff. At home I get to add vegetables 🙂 but I still keep it really easy. Microwaved diced yellow potatoes until mostly cooked. Fried on hot: chopped up pre-cooked wieners, onion, garlic, and green bell peppers. 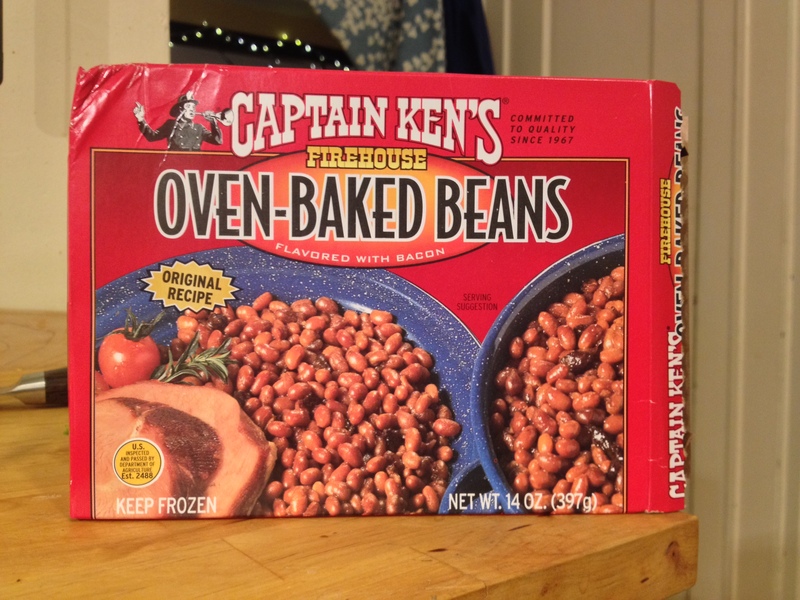 Added Captain Ken’s baked beans. If I’m not so lazy I add my own navy beans, tomato paste, cumin, brown sugar, and cider vinegar. This time I took the short cut. Tweaked the seasoning, added hot sauce, some extra sundried tomato paste I happened to have, and more cider vinegar. 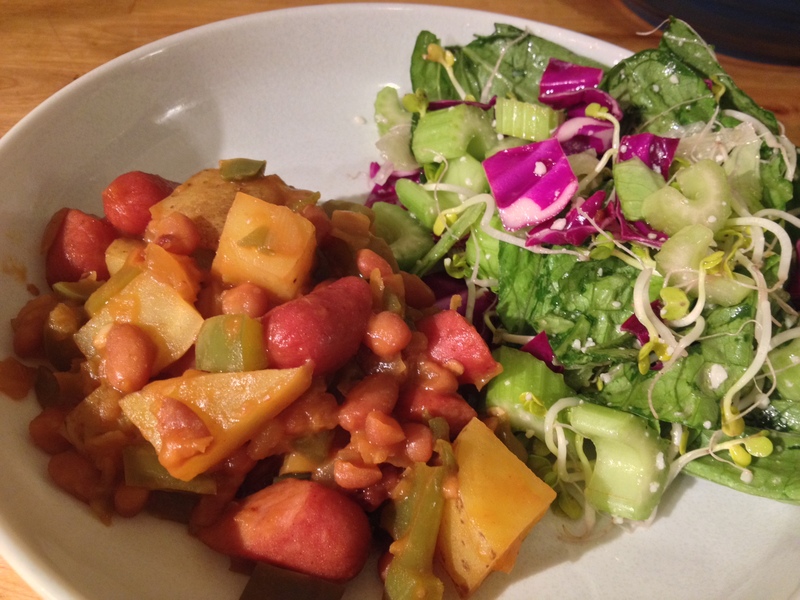 Added the potato and let it all simmer together while I assembled a salad. Yesterday we had celebration steak. The steak wasn’t anything special, but I was 🙂 I’ll tell you why I was having a little celebration later. 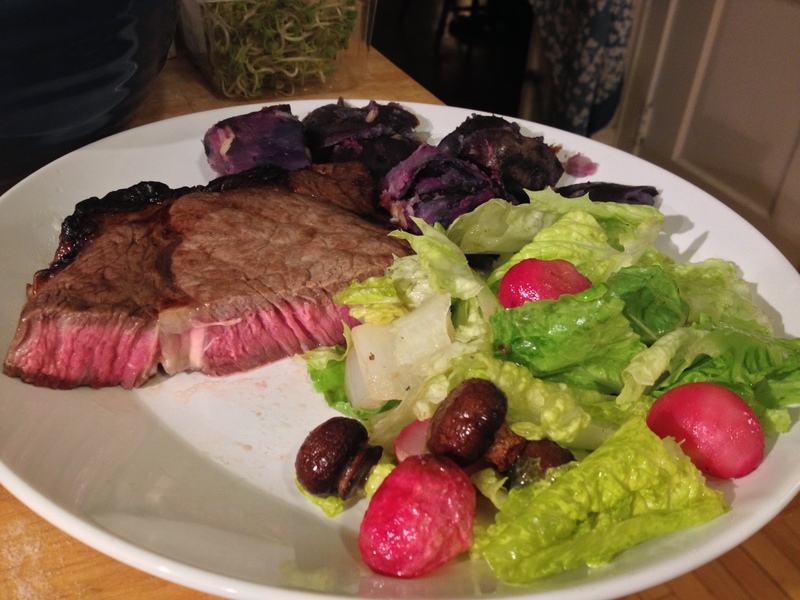 Those are purple potatoes in the back. They didn’t turn out nearly as well as my normal red potatoes do. Super easy. I cooked it mostly while watching the olympics. My well worn Cooks Illustrated in the background. Never ending thanks to Jeff who got me my first subscription. Pan cooked the potatoes using my trusty Cook’s Illustrated recipe. Meanwhile ripped up some lettuce, drizzled with vinegar. 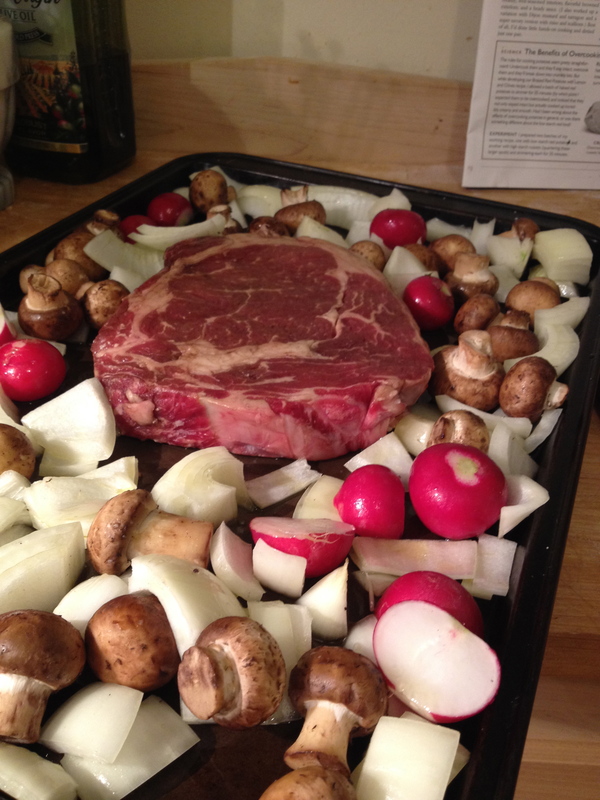 When the steak was done I tossed the hot roasted veggies with the lettuce and let it sit for a bit while the steak rested. Ate it with horseradish and steak sauce. 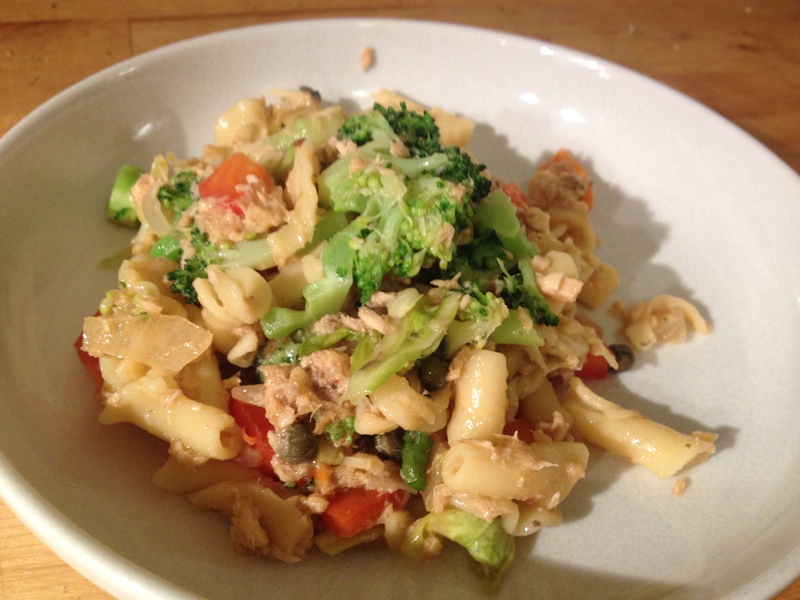 This entry was posted in Kym Cooked and tagged camp food at home, canned salmon, cooking, Cooks Illistrated, food, steak. Bookmark the permalink. 1 Response to Salmon thingy, beanie wienies, and celebration steak!